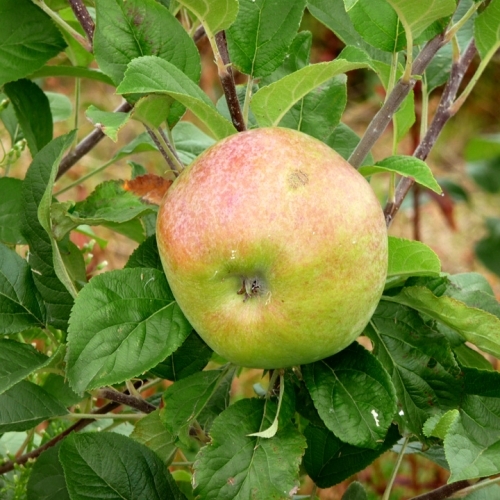 Cooking Apple Howgate Wonder fruit trees - Raised by G. Wratten at Howgate Lane, Bembridge, Isle of Wight in 1915 from Blenheim Orange x Newton Wonder. Received the Award of Merit from the Royal Horticultural Society in 1929. One of the largest cooking apples in cultivation today. A very useful garden and exhibition variety. A good choice for northern gardens or frosty sites. Ground colour pale green to yellow with three quarters flushed with brownish to red. Picking time early October. Pollination group 4. A healthy looking tree, delivered in perfect condition. As always, good service from Blackmoors. I bought this tree as a bare root maiden in Autumn 2013. The maiden was a good size and to my surprise produced 6 big apples in its first season. Excellent quality! I've used this site before to purchase a plum tree, and I was VERY happy with the quality. The only problem I had before was that even though I selcted the 'collection' option, I got an email confirming the 'delivery'. The same has just happened again!